 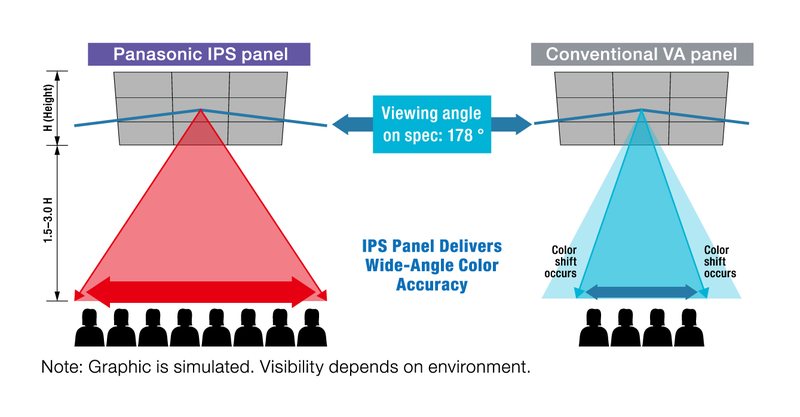 A ultra narrow frame for optimal multi-screen layouts. 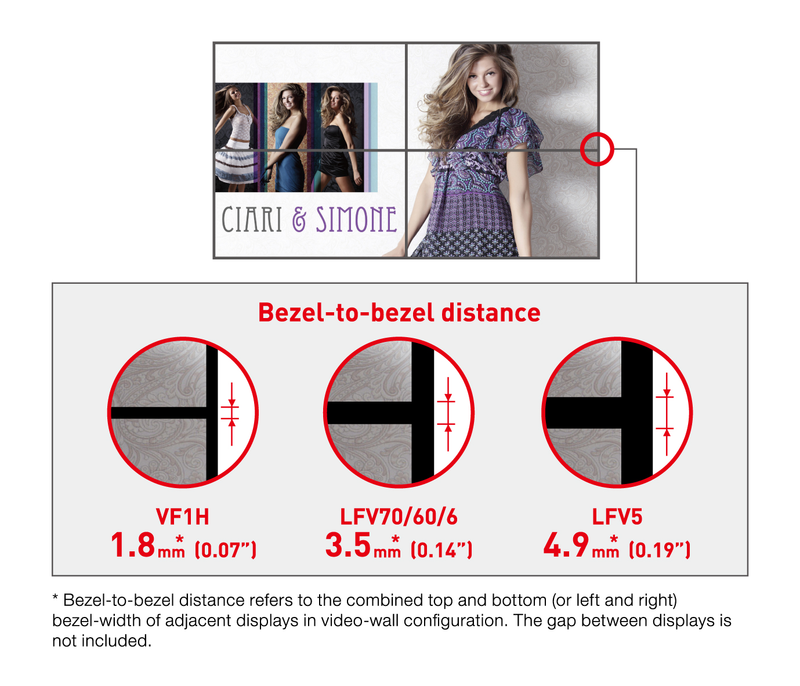 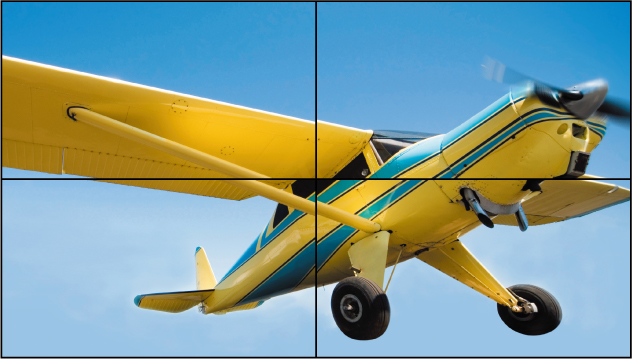 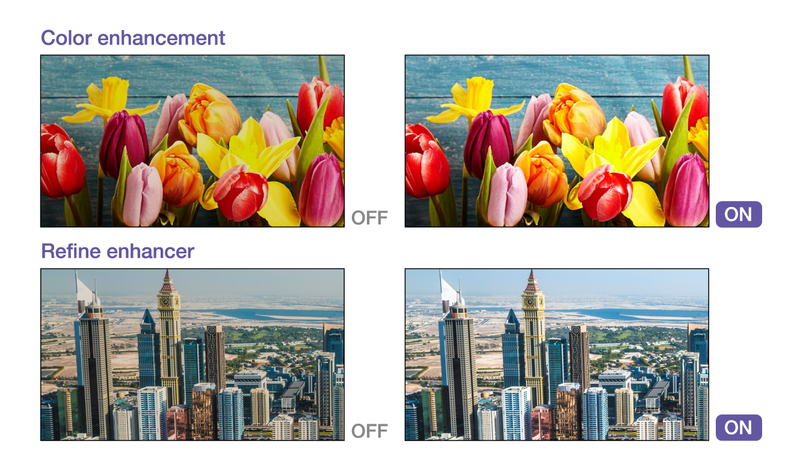 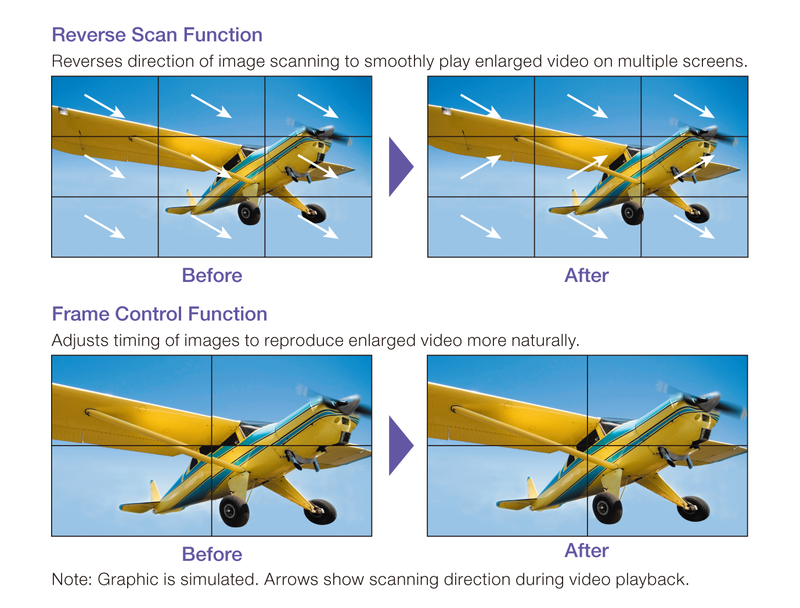 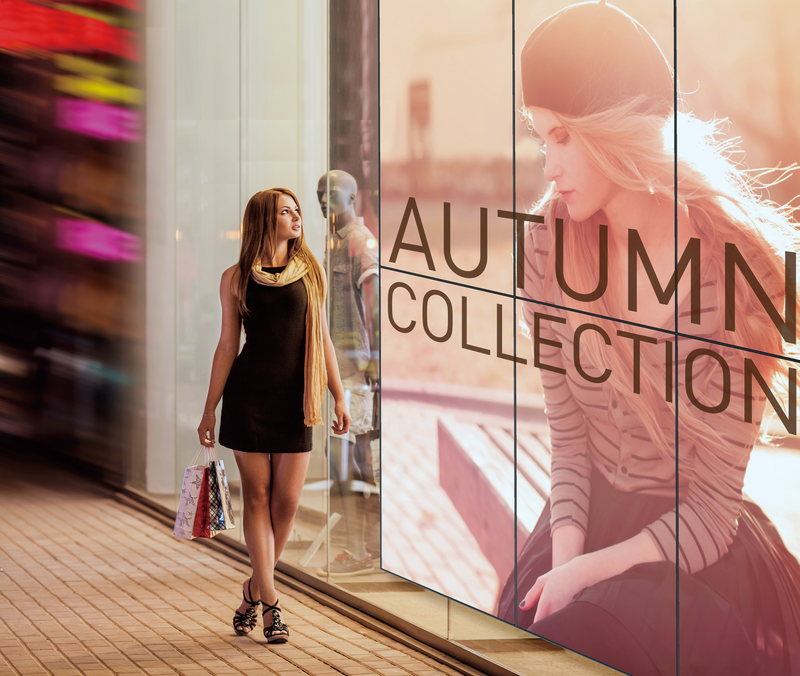 Narrow frames on Panasonic's LCD Video Wall Series reduce bezel-to-bezel distance to a near-invisible 1.8 mm*. 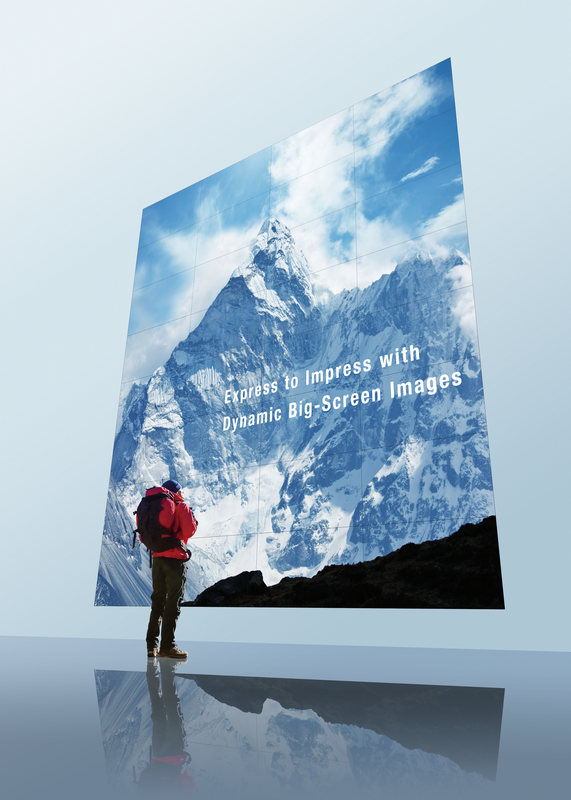 Even when viewed close-up, screen borders are almost indiscernible, resulting in truly spectacular large-format images. 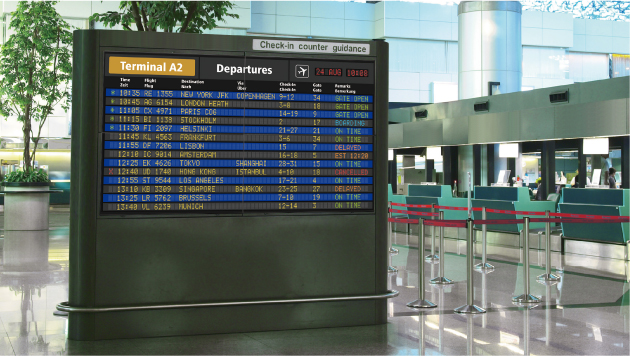 Optional ET-SWA100 Series* Early Warning Software monitors all display devices over the network. 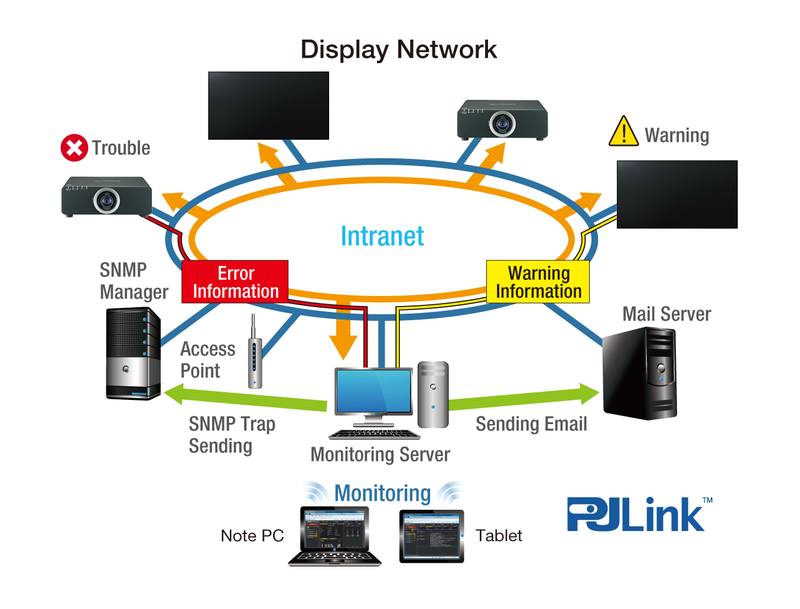 Administrators can monitor device status in real time, view operation history, and receive alerts if abnormalities are detected. 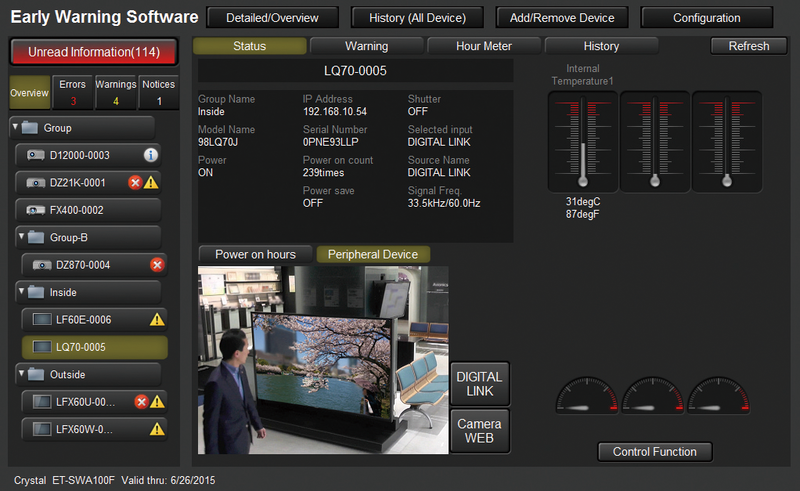 Monitoring servers with this software installed can be checked via tablet or notebook PC browser. As well as minimizing downtime, the software reduces unnecessary visits to remote display sites and saves service time and cost. 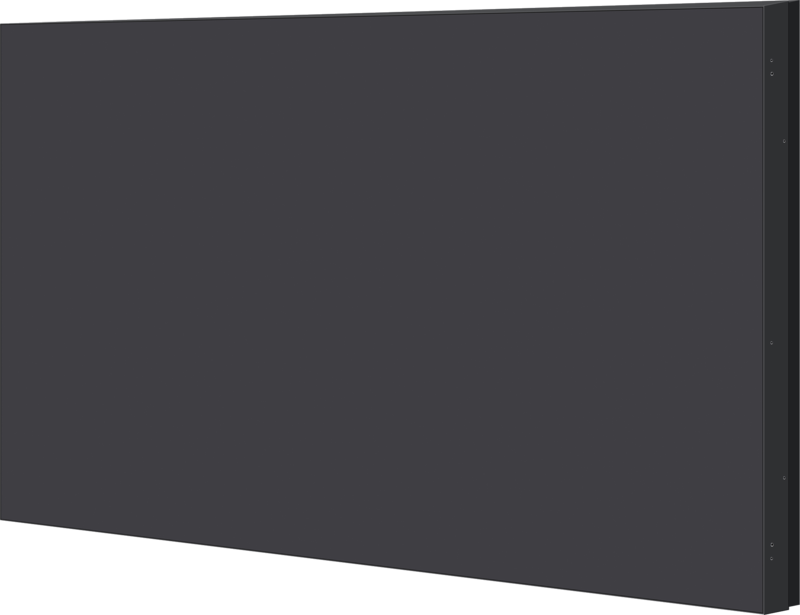 * Part number suffix may differ depending on the license type. 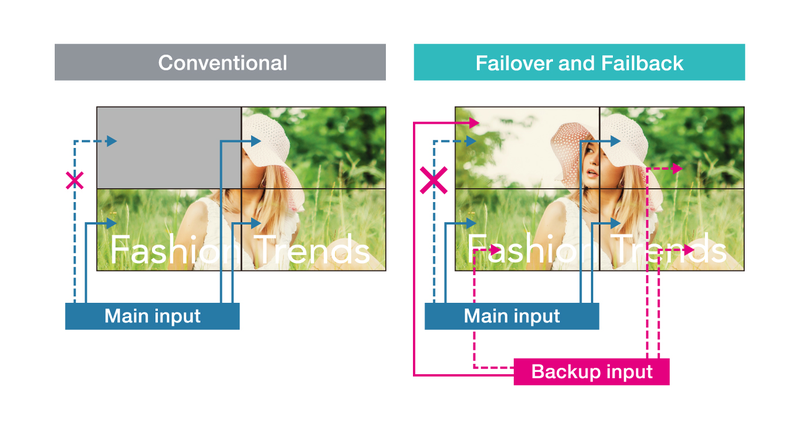 Note that some potential device failures cannot be predicted. 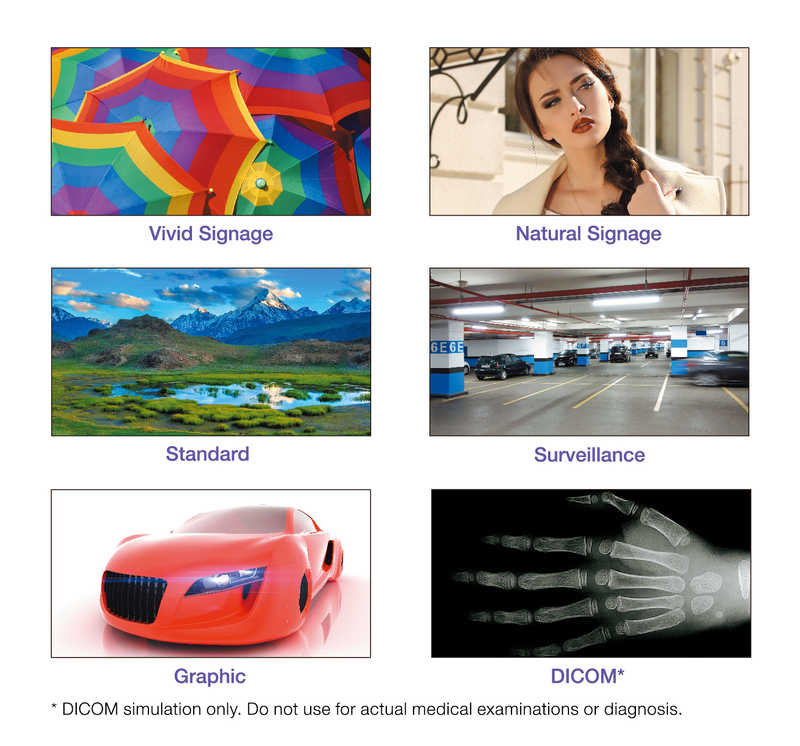 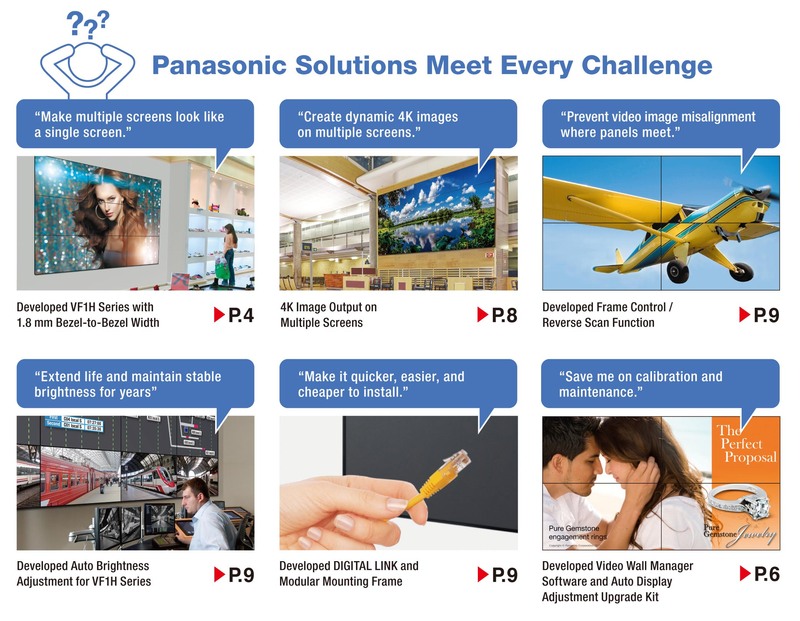 For more information about Early Warning Software and our free 90-day software trial* promotion, please visit: http://panasonic.net/prodisplays/products/et-swa100/ * Available with software version 2.1 or later. 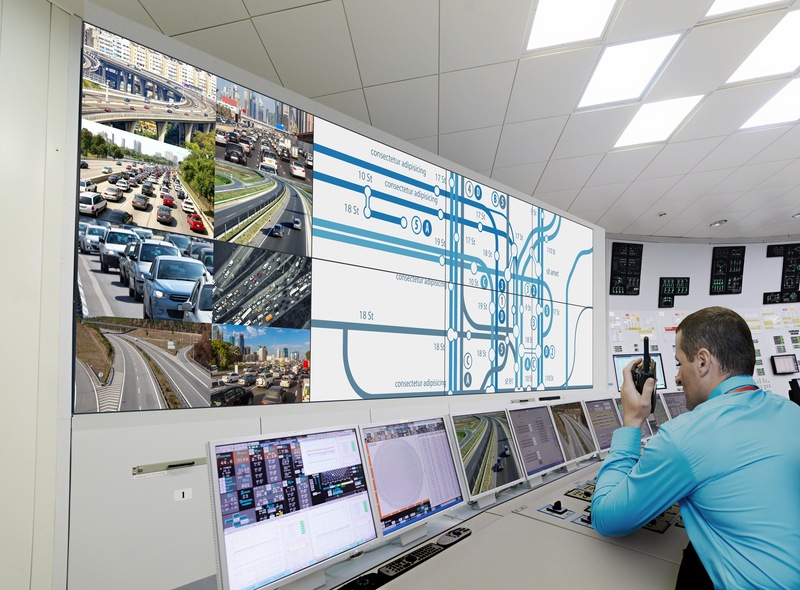 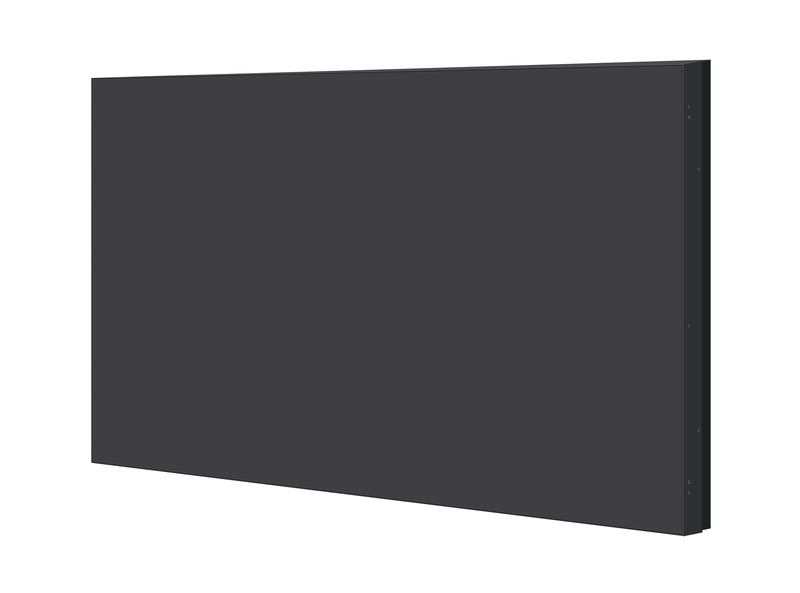 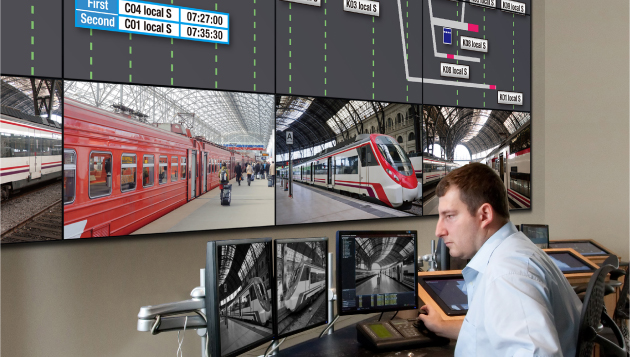 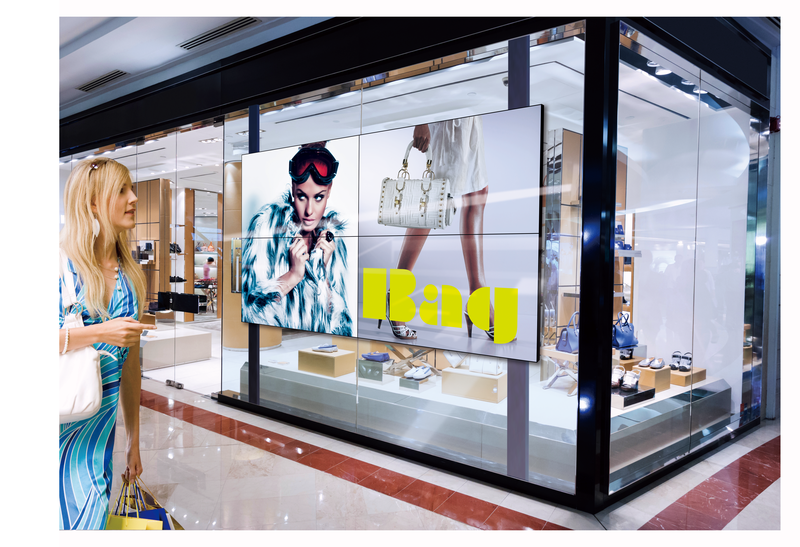 Based on HDBaseT™ technology, the DIGITAL LINK connection on VH1H display supports audio, video, and control signal transmission over long distances, and can also be used to daisy-chain multiple displays via a single cable. 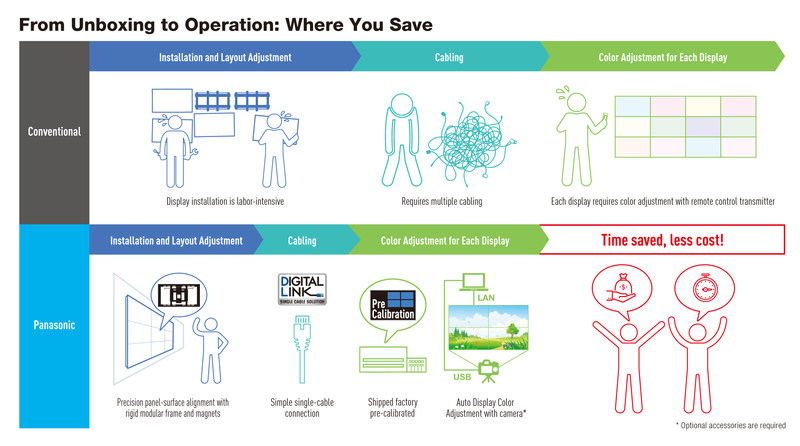 This eliminates the need for video splitters and other routing devices. 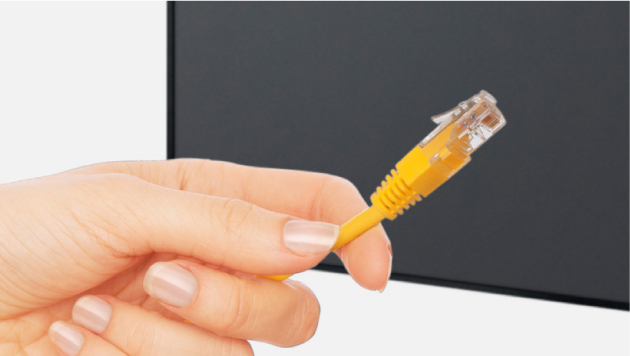 Note: CAT5e or higher STP cable required. 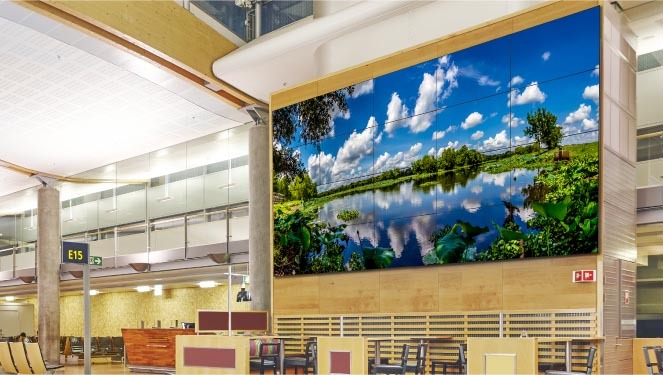 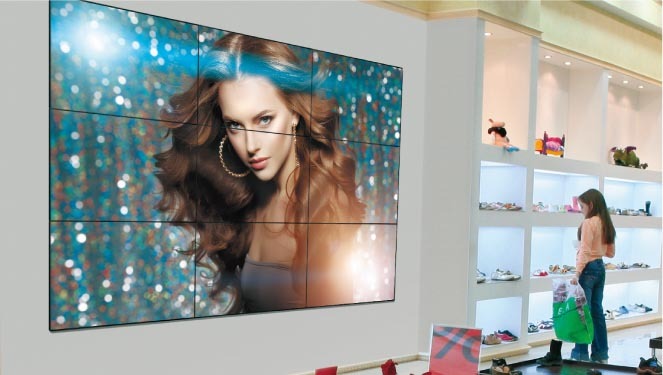 Optional Installation Mount makes setting up a spectacular video wall comparatively quick and painless. 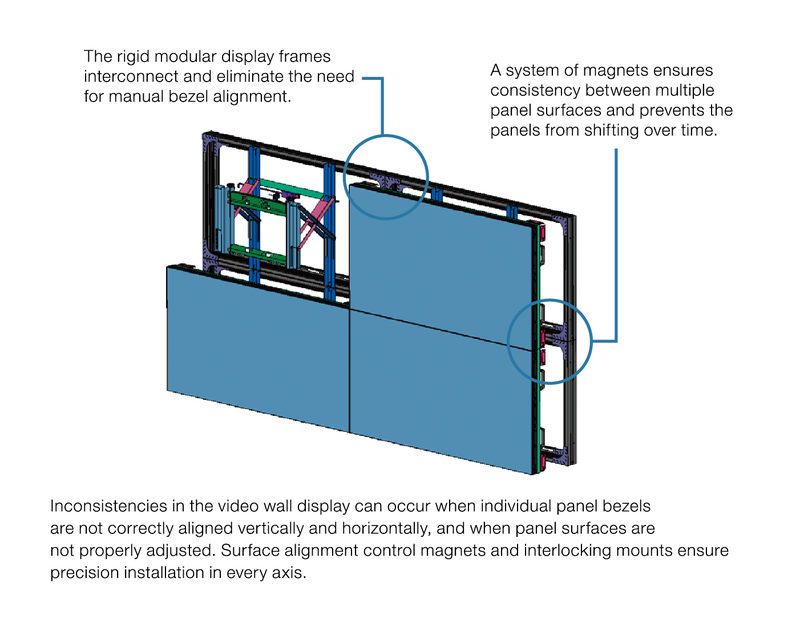 As well as saving time and reducing labor cost, the rigid mount also eliminates potential panel-surface alignment inconsistencies with the use of an automatic magnet system. 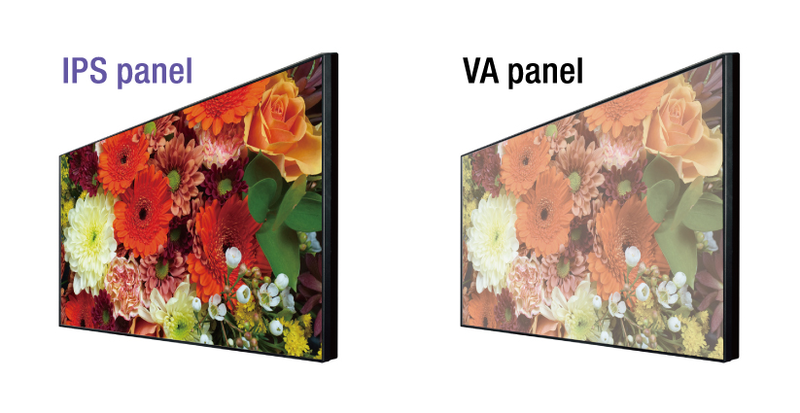 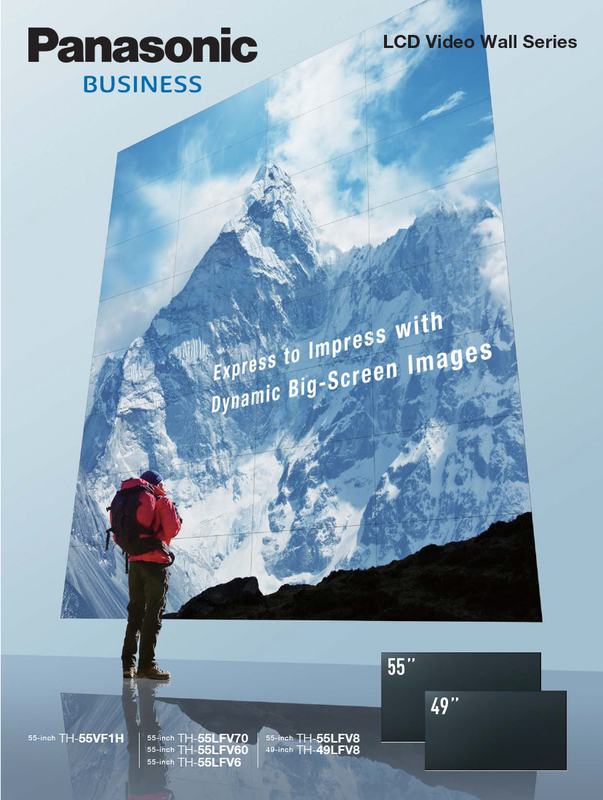 The Panasonic LCD Video Wall Series also features optional cover frames for extra protection against impact. 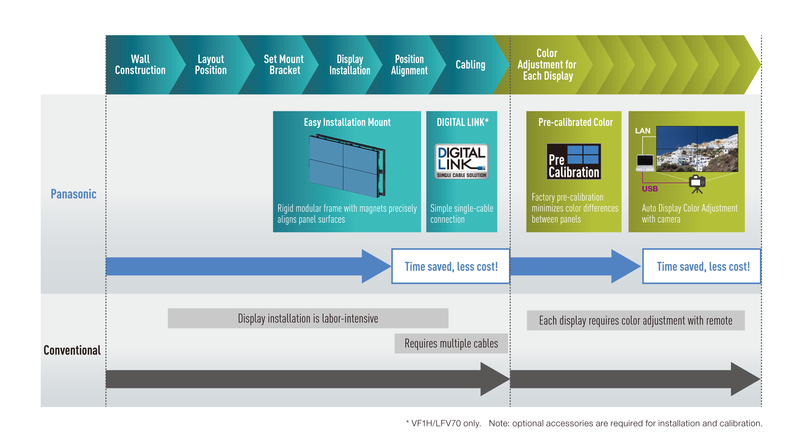 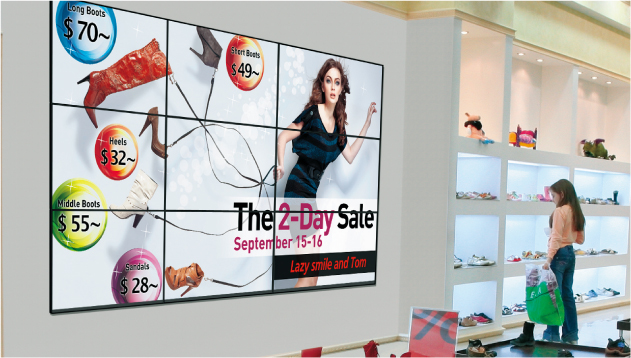 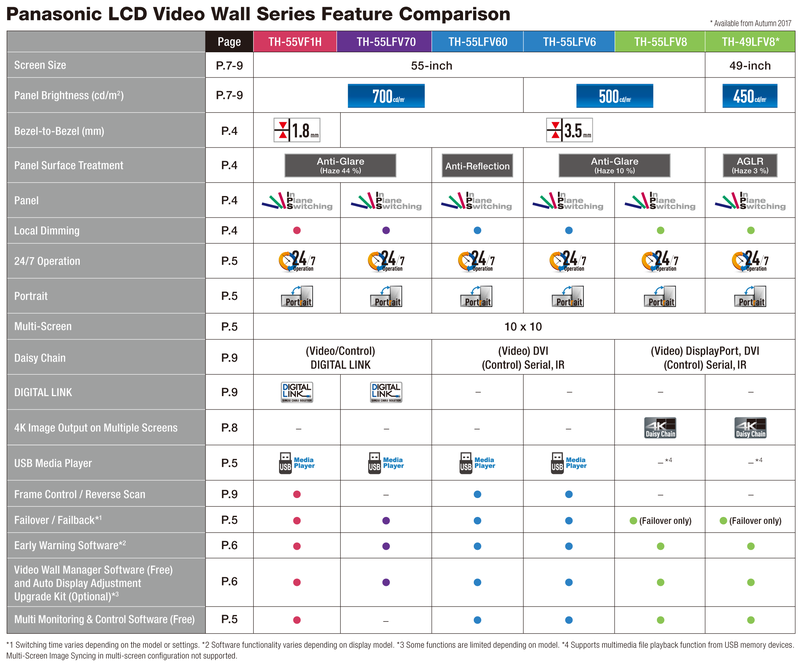 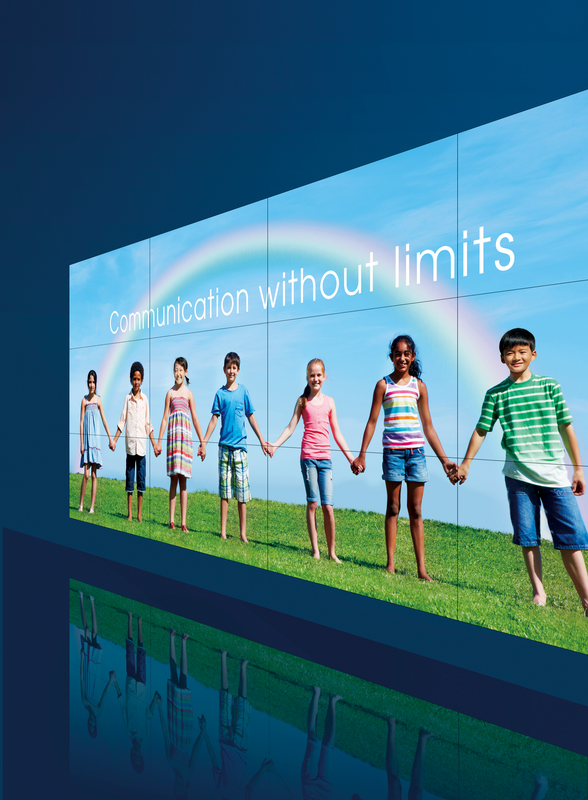 Panasonic's free Video Wall Manager software can be used with LCD Video Wall Series displays. 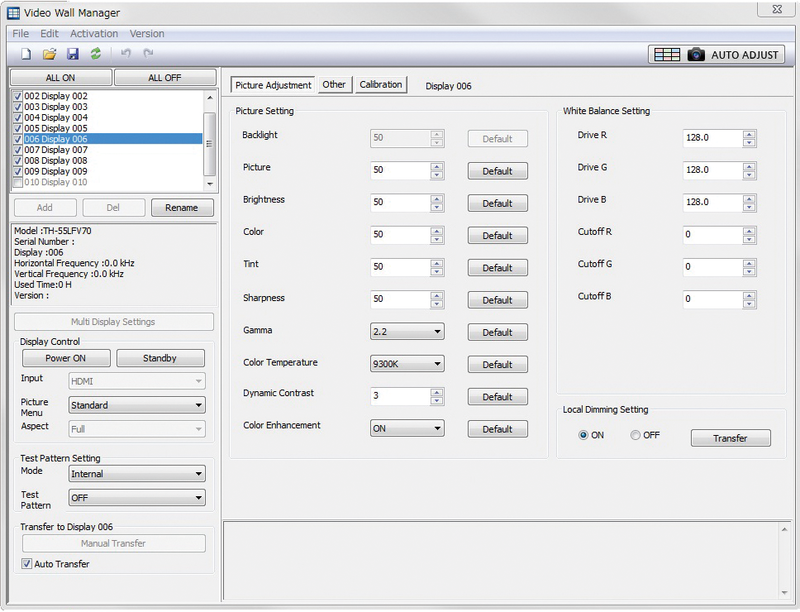 With this software, you can calibrate display color using a color sensor, adjust display settings, and control and manage data via PC. 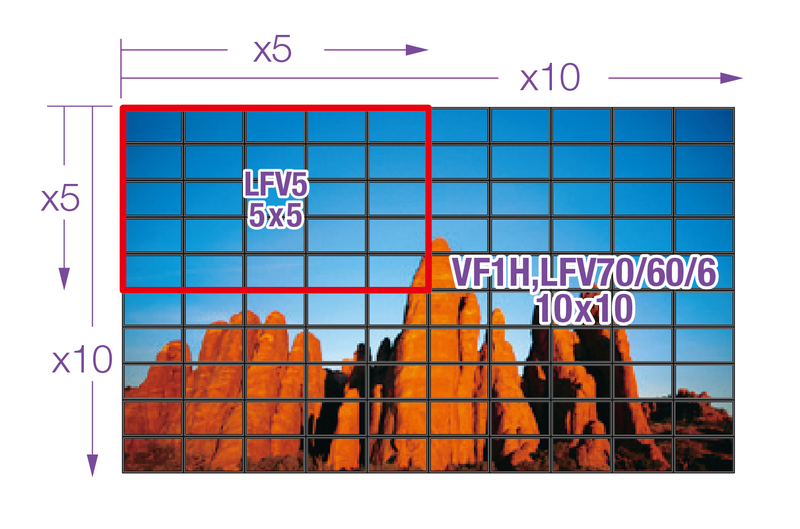 If software is upgraded with an optional TY-VUK10 Auto Display Adjustment Upgrade Kit, brightness and color among multiple displays can be automatically calibrated using a compatible camera (Nikon D5200/D5300/D5500)*. 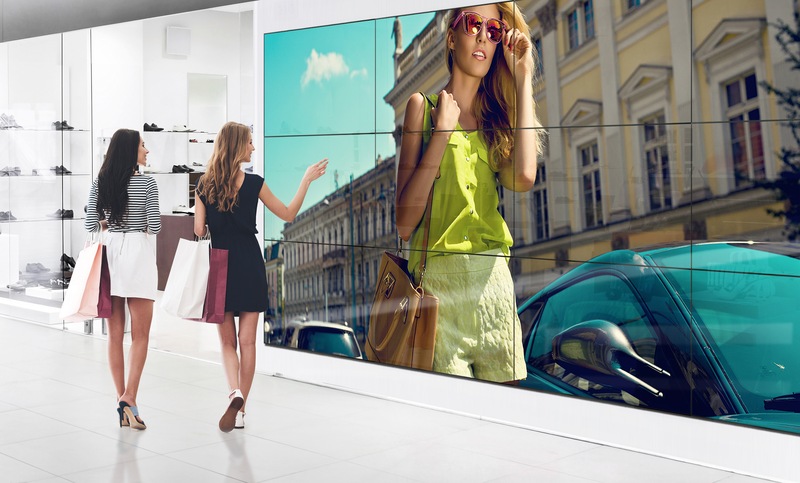 EY relies on Panasonic displays at the CFOspace in Eschborn. 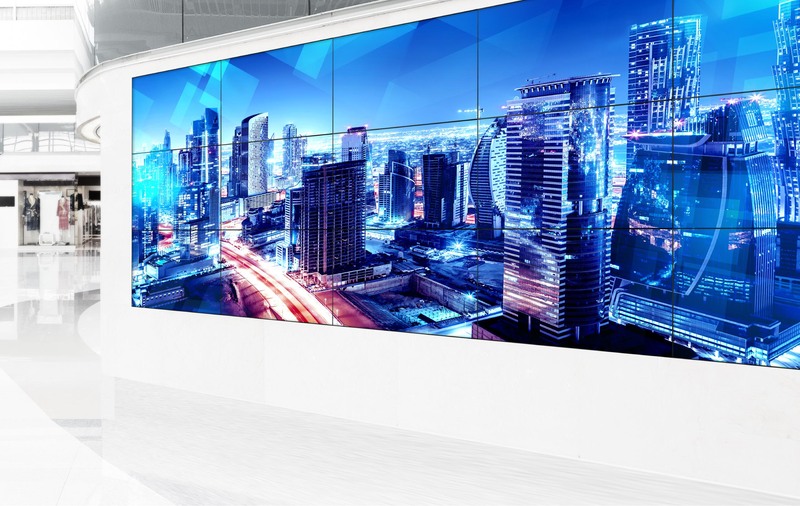 EY has created a multimedia showroom and meeting room which impressively shows how modern technology can improve working environments alongside the benefits of collaborative working.